Use Flash Card Math Free! Flash Card Math improves automatic recall of basic math facts and is included with subscriptions to Ascend Math. Comprehensive reinforcement in basic addition, subtraction, multiplication and division skills. Practice in whole numbers from 0-12. Choose one number to work on, a range of numbers, or from a preset range. Optional motivating self-timer helps students gain confidence. Self-guided review allows students to work independently and at their own pace. Flash Card Math has never been for sale. We want every student to understand their math facts. To support this mission Flash Card Math is free for all students to practice their math flashcards online. 2. Put in your first name. 3. Select the operation and number or range. 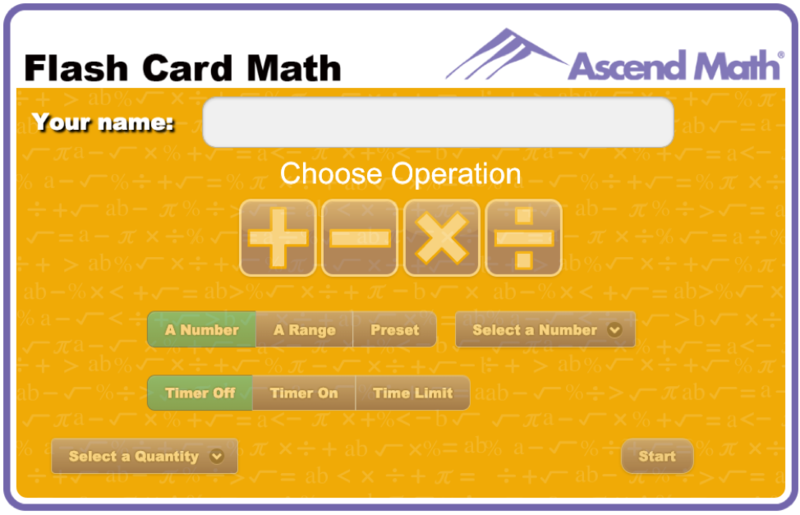 You can also access Flash Card Math from the Ascend Math Homepage> by clicking on the yellow Flash Card Math rectangle.